The second round of submissions for the renewal of the WARO (Wild Animal Recovery) concession needs to be in by the 15th of February. It seems that the Department of Conservation is continuing its path of letting hunters down by having narrowed the scope of the review to being about the land available and not the model itself. Currently they are proposing to open up a number of high value recreational areas that have previously been closed to WARO. Not that being closed to WARO really meant a lot, when the granting of “one off” permits to some of these area’s has been standard practice, and even taking as little as two weeks to obtain from Doc despite there being no monitoring or science on which to base this. We all agree we need the help of WARO in controlling deer numbers, but the current “free for all” model is extremely short sighted with regard to our conservation values and our recreation. This “free for all” WARO model was fit for purpose on it’s introduction back in the 70’s when our deer were certainly out of control, today they are miles away from even being close to those numbers. Quite simply the Fiordland Wapiti Foundation has proven there is a better way, with recreational hunters actually paying for herd management as well running a very substantial rat & stoat trapping programme. If recreational hunters are prepared to get their wallets out then there’s no reason this approach cannot be rolled out over some of our other significant herds, and the result would be a win win for everyone. By significant herds I mean area’s that have historical significance and where traditional genetics still dominate. For example some of the Otago high country with its Scottish genetics and Canterbury high country with it’s original English blood. These areas were revered by sportsman early last century for the phenomenal animals they produced, but in recent times the only thing that’s been letting those stags mature is 1080 buffer zones or low venison prices. With an FWF style model recreational hunters would be more incentivised to hunt with a higher quality yet lower density herd, which is obviously more beneficial to our conservation values. A lower density in these more significant area’s won’t affect anyone’s ability to just go out and fill the freezer, as even at a lower density there will still be enough to keep meat hunters happy. The win here for the WARO boys is consistent levels of work and maintaining viability, with recreational hunters contributing to the cost of deer control in times of low venison prices. At what point will the Department of Conservation actually accept that our big game animals are here to stay, and manage them as the resource they are? , Or have the extremist pipe dreams of Forest & Bird become more important than managing our public land for conservation and recreation? Large amounts of our private land are managed for hunting, because of the income it generates with both trophy hunting and WARO taking place. These landowners see the value in having a quality herd so restrict WARO to shooting hinds and inferior stags only, yet public land it’s all about shooting the heaviest animals for the hook, often leaving the yearlings to get bigger and shoot later. WHY ARE THESE 195,000 HUNTERS PUTTING UP WITH THIS HALF ARSED MANAGEMENT AND CONSULTATION? What this boom and bust cycle means for our recreational hunters is that during a boom all operators are targeting large bodied stags particularly during Jan and Feb because they represent the heaviest weight on the hook and higher value per kg. 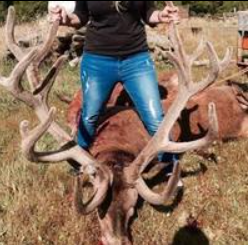 These large stags are of immense value to recreational hunters and are essentially the drive and motivation for the majority of hunters, not to mention the significant historical value of some of these herds. As recreational hunters it’s agreed that we certainly need the help of WARO to control numbers, especially in our more remote areas, but we also need to value the world class hunting resource we have and continue to improve recreational opportunities for everyone. Recreational hunters drive a significant industry with a 2011 study stating an average yearly spend of $3700 each on hunting and hunting related goods and services (Big Game Hunters Survey - Lincoln). This puts the direct spend of domestic hunters at $614 million using the Mountain Saftey Council numbers from above. Add in another 45 million that comes from 15% of the total number of international hunters that actually pay something to hunt here(4000+), and use the services of Professional Hunting Guide Association members (Scope Magazine - NZPHGA). This makes for an industry directly worth a minimum of $659 million dollars. Compared to the $166 million last year in venison exports (NZ Deer Industry), of which only a tiny percentage is feral venison from WARO. So, the question is why are we putting the interests of a handful of concession holders first, and destroying the recreational value for a large number of people? These are people who also do more for our conservation values and have an industry worth a minimum of 40 times more in turnover?? Hunting although not everyone’s "cup of tea" is ingrained in our heritage and culture and we are lucky enough to have potentially the some of best hunting opportunities available worldwide, yet we don't value the resource and continue to plunder it. Only shooting females, this will actually lower overall numbers, which is the intention of the consession in the first place. Introduce a system for our special herds, where by recreational hunters can contribute to herd management. Very clearly our Deer, Chamois and Tahr are here for good, so by treating these animals as the resource they are and managing them as such, we will be improving our recreational opportunities, tourism revenue and supporting significant industries whilst at the same time more effectively controlling herd numbers. By not changing our approach to game animal management, we are just continuing to periodically destroy our recreational opportunities in exchange for creating sporadic turnover for a select few WARO concession holders. Please be sure to get your submissions in before Friday, whatever your thoughts are. Also write to your local MP and let them know your thoughts.